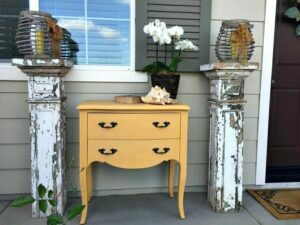 10 Tips for Scoring Great Finds at the Thrift Store -See What I Found! I love thrift store shopping and it is my place to go whenever I need some “retail therapy.” I almost always score something fabulous and rarely spend over $25. I have found great designer items with the tags still on them. My favorite thrift store is Goodwill, although my sister, a fellow thrift store devotee who lives in New York, does best at Savers. I have amazed my friends with some of my famous scores including a pair of Christian Louboutin shoes for $12.99. That is not a typo! 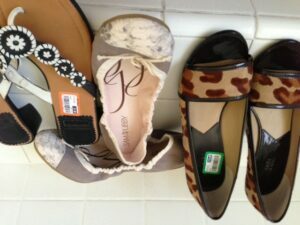 I have also scored Tory Burch flats for $7.99, Ferragamo shoes for $9.99, St John Knit sweater sets for $9.99, Lily Pulitzer dresses, and on and on. Over the last few years, we have decorated my daughter’s dorm rooms and campus apartments with thrift store scores including desks, chairs, lamps, curtain, and housewares. 1. Location – look for a store in an upscale area, a retirement area, near a college, or near a tourist district. Did you know that hotels often take unclaimed clothing and electronics to the local thrift store? 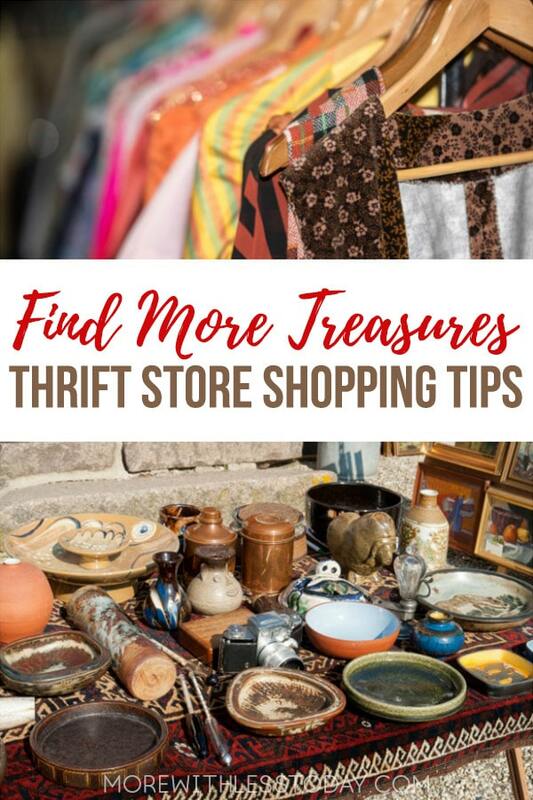 While on vacation, search for a thrift store in a tourist location. You can often score treasures to bring home for just a few dollars. 2. Fabric -develop a good eye for quality fabrics and learn to scan the racks this way. You can spot well-designed garments at a glance when you begin to recognize a quality wool, silk, or knit garment. Next, I check the tag, size, and condition. Hold the garment up the light and check for holes. 3. Discount Days – know the discount days and sales at your local stores. Some offer a discount on certain days, certain items, certain tag colors, senior days, or offer VIP cards to save all the time. Ask at the register if they are running any special promotions and shop accordingly. Showing up on the right day can mean the difference between a $10 thrift store find–or a $5 score. 4. Try on everything if at all possible. Stains, holes, missing buttons and broken zippers are common candidates for the donation pile, but you may not spot a fatal flaw until you try the garment on. If you have the sewing skills than you are ahead of the game. If not, find an inexpensive tailor. My dry cleaners will do simple alterations for just a few dollars. I buy all of my work pants at the thrift store and usually need to have them hemmed. 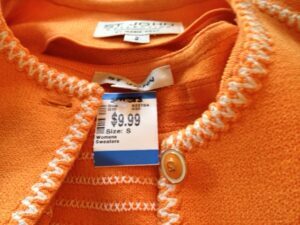 Factor in the cost of alterations to determine if that item is still a good deal. Often the answer is yes! 5. Know your brands and know how those brands fit you. I know how my favorite brands are sized. When I spot one of those, I don’t even have to try it on or get it tailored. Many stores these days are organized by color or size, making finding those perfect items that much easier. 6. Keep a list. I have a list of needed items for my wardrobe and often find accessories to change up an outfit for very little money. I also keep a list of items that my friends and family may be looking for. Buy in the offseason and buy next years sizes for your kids. 7. Buy out of season. If you spot a winter coat in the middle of summer, buy and it and store it. Our kids grow quickly. Buy ahead and keep an eye on future sizes. 8. Take a friend. My sister and I can divide up the thrift store and shop for each other. When we meet in the middle, we usually have a cart full of items to try on, some for her and some for me! 9. Be patient. It may take you quite a while to sort through everything and you may not end up with one item. Enjoy the process. bought for $12 at Goodwill, a perfect addition to my home office! 10. If you spot it, add it to your cart. You can edit at the end. In most cases, if you pass on an item, it will not be waiting for you the next time you visit. One more tip… read the fashion magazines and take pictures of outfits or looks that you like. 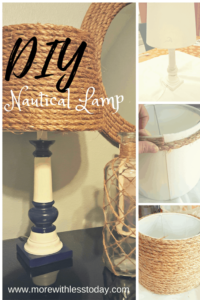 Trendy items can often be replicated with thrift store finds! More With Less Today tip- I live in southern California and my family lives in New England. I bought a winter coat and snow boots at a Goodwill store in Connecticut during one of my visits and I leave them stored in my mom’s basement. I don’t have to stuff my winter gear in my suitcase every time I visit. I just bundle up in a few sweatshirts or sweaters until I get there. Shopping at thrift stores will change how you view department store and even discount store prices. Where are some of your favorite thrift stores? We would love to hear from you! Click on the photo and PIN it to Pinterest! Hi! Loved your article on thrift shopping. Please go check out a Savers thrift store. There are 2 in your area (I live near you in Fullerton). The closest one is at Imperial Hwy and Santa Gertruddes in La Mirada. There is also one in Anaheim on Lincoln. The stores are so clean and organized. The staff is pleasant. I also discovered a new store in the Orange Mall. Overstock Supercenter is on the north end inside the mall. They sell furniture, art, and home accessories. They were receiving a large shipment from the Loehmann’s closeout, so they expect to have some clothing and shoes. I found some beautiful shawls/scarves for $9 each.